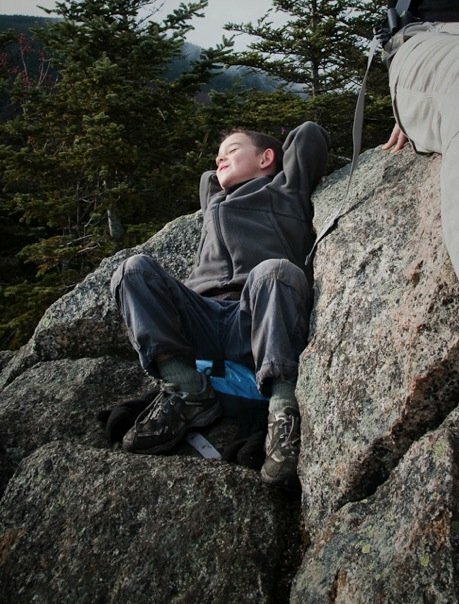 This Friday, Peter Begley and his remarkable, not-quite-five-year-old son, Caleb, will drive from Boston to the Ammonoosuc Ravine Trailhead, wriggle into their backpacks, and start hiking to Lakes of the Clouds Hut. Peter’s wife Megan, an AMC employee, will already be en route to the same hut, leading a President’s Society hike, and will meet them there. If several years of family tradition holds, Caleb’s pack will hold little more than a water bottle, a jacket, and a toy to play with at the hut. A whistle that Caleb knows to use in an emergency stays looped through one of the straps, because, Peter says, “I think about things like that” — that being the safety of a whistle, and also the extra protection the pack affords Caleb’s back if he stumbles on the trail. Peter Begley considers himself a “late-bloomer” in the mountains and on hiking trails. He grew up mostly in California and the Southwest and credits his parents with instilling a love of the outdoors in him through family trips to national parks. But it wasn’t until he and Megan moved East that he started hiking regularly and his childhood love grew into a passion. Now Peter wants to encourage that same love in his son, from Caleb’s interest in flowers and mushrooms to his pleasure in scrambling up rocks and sleeping in a tent. He climbed his first 4,000-footer, Mt. Hale, before he was four, and completely under his own steam. About three-quarters of the way to the hut, as the trail steepens over rock slabs that can be tricky to navigate when they’re wet, Peter’s focus will likely return to safety. If tradition holds, Caleb will also be pretty focused. “When we have a specific goal, like getting to a hut, he’ll ask, ‘Where are we, Dad?’” Peter says. “‘Are we near the hut yet?’” Peter will hold out his hand, and Caleb will take it. It’s safer, and they like to hold hands while they’re hiking. The next day, while Megan remains at the hut with the President’s Society, Peter and Caleb will continue gently downhill along Crawford Path past Mts. Monroe, Franklin, Eisenhower, and Pierce (or, weather and energy permitting, up over their summits) to the Nauman tent site next to Mizpah Spring Hut. Peter may find opportunities to pass along lessons to Caleb about getting past what he calls “the monotony of hiking.” It’s a mental challenge that Peter believes will pay off for his son well beyond the confines of a hiking trail. Even though Caleb won’t turn five for another few months, Peter can already see how their time together outdoors is instilling “self-confidence, self-reliance, a sense of higher purpose” in his son. No doubt they’ll hold hands. On Sunday, father and son will wake up at their tent site and pack to head back to the trailhead, Boston, and home. If their rich tradition of time together outdoors holds as it should, it’ll have been a perfect Father’s Day. Photos: Caleb Begley on Mt. Avalon; Caleb and Peter on Mt. Moosilauke. Photos by Peter Begley.